5.0 颗星，最多 5 颗星One of my favorite self-care, style, respect yourself, present yourself well books! Full of great suggestions. 5 Stars!! This is one of my absolute favorite self-care, style, lifestyle, get-your-act-together-and-respect-yourself, how to present yourself well to yourself and others without making a big effort out of it or acting like a snob books. As a young adult the author traveled to France to live for a short time, and the lessons she learned there about fashion, food, home styling, self care and beauty routines changed her life forever. The most wonderful thing about this book is how simplistic it is! The tips and suggestions are simple, practical, logical, and easy to adapt for just about anyone anywhere. She makes a point of this by presenting the two families she lived with while in France and how even though the families were different (where they lived, their individual style) the principals of their approach to life is the same. This book is a great read for any age - from teens to young adults to anyone older, middle aged on up. There's no age restrictions on taking care of oneself! This is the kind of book that readers will keep handy and refer to often. Sometimes I pick this book up and re-read different sections, especially if I need a style/care boost or a reminder why I should toss out those worn out sweat pants once and for all (ha ha). I highly recommend this book! I enjoyed the personal stories - they were innocent, sweet and funny. We have all heard the stylish secrets before, but this book reminds us in a very pleasant and positive way that there are indeed other cultures that live a less-is-more, simpler way of life. Bottom line: the author suggests living a more cultured, formal lifestyle. I think the book is best suited to young women just figuring adult life out. For those of us half-way through living our lives in America, some of these tips would be hard to incorporate into our current lifestyles due to large cultural differences : although I would love for my entire family to have dinner together every single night at the same exact time, it's not feasible. There are activities, working long hours, etc. . Some of the "stylish secrets" did not appeal to me at all. Buying formal furnishings for my living room so that I would not be tempted to lounge on my couch is something I would never want to do. I enjoy relaxing in my living room! Some of the secrets are a bit silly: creating an aura of mystery about oneself? Hmmm. This could invite unwanted attention. Again, for the young. The book had me reminiscing about more carefree days when I had few responsibilities and did a lot of traveling around the globe. There is nothing that feels quite like being young and free! All in all, it's a cute book that left me feeling uplifted. I've been in a rut for awhile. I picked up several ideas of little things I could change. I'm listening to classical music again; I recently had dinner with a friend and we talked books instead of gossip; and, I'm planning a trip to an art museum for the first time in over 15 years. Thank you! I absolutely love this book! Jennifer Scott clearly explains simple and practical ways to return to a life of grace and style while performing the high duty of being a busy mother and wife. Although she was inspired by a Parisian woman, many of these tips are actually practices that my mother and my grandmother did on a daily basis. It seems that we have gotten away from common sense and practical feminine wisdom and traded it in for disposable fashion and poor manners. 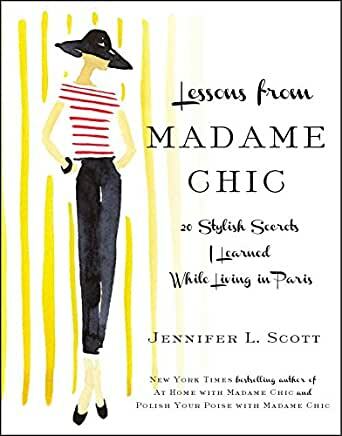 Jennifer Scott's book reminds us to channel our inner diva and return to a life of style and grace through the virtues of hard work, self care, common sense, self respect, and impeccable manners. She encourages us to take time for ourselves, ditch disposable fashion,and embrace our individual classic feminine style. THANKS JENNIFER!